Termites, scorpions, ants, and other pest invaders in Arizona can become a great nuisance to any homeowner. Pest control services in Phoenix can treat the common pests in your area to provide you with a home or office setting that is comfortable and free of annoyances. While some pests are a simple nuisance, others can pose dangers to your health and safety. Here are some tips to follow to reduce the risk of pests in your home. One of the things you need to determine is how pests are getting into your home. A scorpion can easily squeeze into the home through a small crack in the foundation. They often hide in areas of decaying wood, rocks, and trash piles. Clean out these areas and seal all access points to the home to prevent the pests from getting inside. While some people try to get rid of pests on their own, it can lead to serious problems if you do not know what you are doing. A sting from a scorpion is not only painful, but deadly. It is important to make sure the appropriate steps are taken to prevent individuals from being stung when trying to remove a scorpion from their property. Varsity Termite and Pest Control handles the trapping and removal of scorpions and other pests that can pose a threat to your family. There are a number of methods available to eliminate pests. While some work, others do not have the effect you need to rid your home of pests. It is important to work with a pest control company that knows how to handle all types of pests from rodents to scorpions and roaches. Certain pest control chemicals are toxic to your health, and can cause serious illnesses to your family. Always work with a company that is certified and uses chemicals that will not harm you or your loved ones. Varsity Termite and Pest Control can provide effective pest control solutions to Scottsdale and Mesa, Arizona, residents hoping to rid pests from their yard. 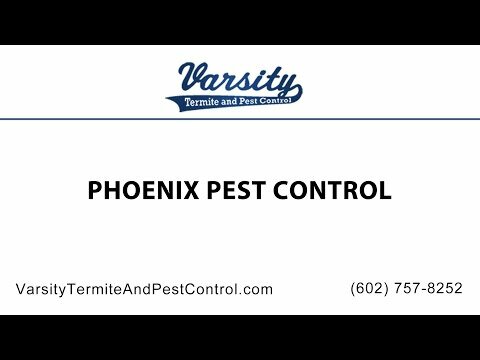 Contact Varsity Termite and Pest Control today in Mesa, Arizona. If you have any questions or concerns regarding pest control in your home. Any one of our professional pest control exterminators in Phoenix will be happy to help. We’ll provide you with all the information and answers you are looking for and need to know about pest control. Our company strongly believes your well being and safety in your own home is very important. We want to help you, so hire Varsity Pest Control today to keep the pests out of your home. Our other services in Phoenix include termite control and scorpion control. Call today and we’ll give you a free estimate.